Graphic Program Generator WinPRO/HVACPRO App. 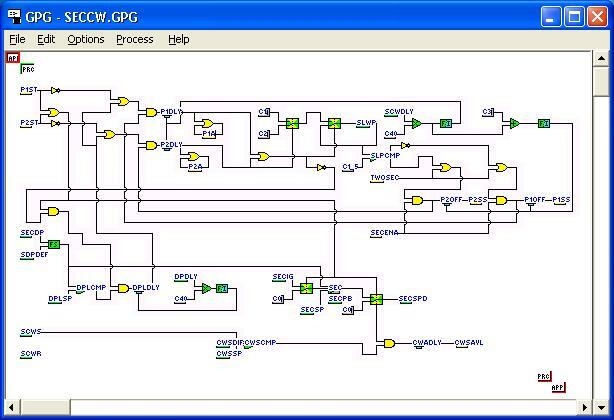 This application of the SWFTEC Graphic Program Generator provides a tool to create applications for Johnson Controls Inc.'s Application Specific Controllers (ASC). The WinPRO Application Builder allows a user to enter a control graphic diagram into GPG and then process the drawing into a WinPRO application for the Johnson Controls Inc. WinPRO/HVACPRO configuration tool. The user can then go to HVACPRO and select the GPG application for configuring an ASC device. The configuration produced from the GPG application can then be used just as any standard WinPRO application configuration. It can be downloaded into a VAV, UNT, or AHU controller so long as the particular device selected supports the point types and numbers needed by the application. The ASC can then be commissioned as usual. The *.DDL, *.CFG, *.PRN, *.LST, and *.ASC files are created as usual. The WinPRO Application Builder also allows adding GPG generated control processes to standard WinPRO configuration files. This allows the user to produce most the the application using the standard Q&A but add special stuff with GPG. This provides more capability for non-standard applications than the WinPRO "side loop". This Application Builder eliminates the application limitations of the ASC devices by allowing users to program the ASCs to do anything using the available functions. You are no longer limited to the choices provided by the standard applications in WinPRO. In fact with this GPG application the ASCs are now AFCs, Application Flexible Controllers. The names, VAV, UNT, and AHU don't mean anything anymore. These controllers can just as well be called hot water system controllers, process controllers or whatever. They can now be used in applications where you might have previously used a DX9100 or an NCM with DCMs and XMs. This can be a substantial cost savings in many applications. Applications you couldn't do before because of programming limitations or cost constraints are now possible. The WinPRO Application Builder works with WinPRO/HVACPRO versions 6.0 and up. It works with Microsoft Windows 95, 98, Me, NT, 2000, XP, Vista, Win 7, (Win 8 and 8.1 need testing) and Windows 10 operating systems. Right click here and select the save file dialog to download the WinPRO Application Builder Manual in *.pdf format. The price for the SWFTEC Graphic Program Generator software is $100.00 USD with the WinPRO/HVACPRO Application Builder attribute and symbol file sets. Also included is the Symbol Packer utility for making your own symbol sets from *.bmp files.